Survivors of the Warsaw Ghetto and German cameramen commenting on the filming they remember from 1942. Discovery of a truth untold. A compelling story that questions the use of footage usually presented as factual. 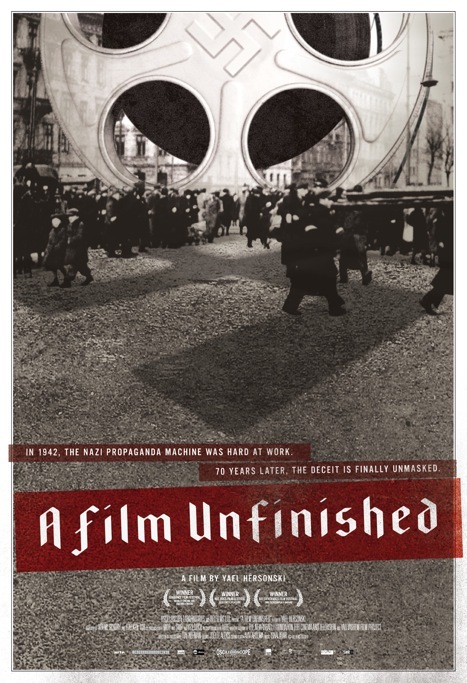 Check out A Film Unfinished Trailer (HD) and you’ll instantly get a sense of what it accomplishes in its powerful 90 minutes. And yes, the dude with the Star of David armband looks strangely like Don Draper. At the end of WWII, 60 minutes of raw film, having sat undisturbed in an East German archive, was discovered. 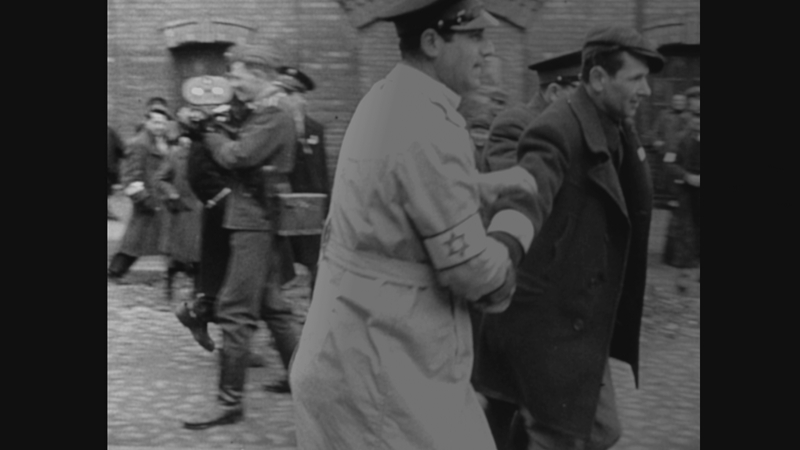 Shot by the Nazis in Warsaw in May 1942, and labeled simply “Ghetto,” this footage quickly became a resource for historians seeking an authentic record of the Warsaw Ghetto. However, the later discovery of a long-missing reel complicated earlier readings of the footage. A FILM UNFINISHED presents the raw footage in its entirety, carefully noting fictionalized sequences (including a staged dinner party) falsely showing “the good life” enjoyed by Jewish urbanites, and probes deep into the making of a now-infamous Nazi propaganda film. You never know quite what will happen when you’re in Israel. Last night was no exception. I was visiting with a dear friend, Rabbi Yitzchak Schwartz, and as we were walking through the streets of the historic neighborhood where he studies Torah, we happened upon images of the area’s early residents. I remembered that earlier this year, ck sent me photos of Alcalays he had found among the portraits of Nachlaots early residents–asking me if they are my family. I mentioned to Yitzchak that I’d like to try and find those images on the wall. It was one of those nights when the weather starts to get colder. The air was thick and and misty. We turned one corner after the next, winding through the tiny streets. I had no idea where we were but when we saw a few more images posted on a wall, I asked Yitzchak if he wouldn’t mind if we stopped to take a closer look. I approached the wall and in the course of what felt like a millisecond, realized I was looking into the face of my family. I burst into tears at the recognition, saying “That’s my grandmother. That’s my grandmother.” Yitzchak stood there dumbfounded, asking me, “How do you know that’s her?” All I could say was, “Because that’s my photo.” This image is part of every book talk I give when I describe what it means to me to be part of a family with historic ties to Israel and how that has informed my own Jewish identity. You can see the image on p. 175 of my book, Cool Jew, where the Levys of Ohel Moshe makes a cameo appearance. My grandmother and her parents lived in one of the early neighborhoods outside the Old City walls of Jerusalem, in the charming and historic area now known as Nachlaot, home of one of Jerusalem’s first Hebrew printing presses and where Eliezer Ben-Yehuda printed his first Hebrew dictionary. Like many early residents, their portrait appears on the wall of the street known as Ohel Moshe, next to the historic synagogue of the same name, which honors its benefactor, Moses (Moshe) Montifiore, who funded it in 1882. I have long known my grandmother had grown up in Jerusalem but I didn’t know exactly where. I did know though, because she had told me in her own words before her passing in 1989, that her mother and grandmother had arrived in Eretz Yisrael on a donkey from Bulgaria. The trip took them three years! My grandmother’s story was confirmed last year when I tested my DNA and learned my only matches are Sefardic Jews of Bulgarian descent living in Israel! Ohel Moshe is located next to Nachalat Moshe; these two distinct areas housed early Sephardi and Ashkenazi residents of the neighborhood now known as Nachalot. During a recent speaking tour in Canada, MK Nahman Shai (Kadima) shocked some of his hosts when he said that his primary goal in politics today is to bring down the Netanyahu government. Although indelicate, Shai’s comment was not surprising. Kadima is in the opposition. And like all opposition parties in all parliamentary democracies, the primary goal of its members is to bring down thegovernment so that they can take power. Given that this is the case, it is unsurprising that until this week, Kadima leader Tzipi Livni tried to blame Prime Minister Binyamin Netanyahu for US President Barack Obama’s hostility towards Israel. Far more newsworthy than her criticism of Netanyahu was her public rebuke of Obama this week for his attempt to strong-arm Israel into barring Jewish construction in Jerusalem’s Gilo neighborhood. Indeed. There is an Israeli consensus. The Israeli consensus regarding Jerusalem is based among other things on the understanding that no nation can give up its capital city and survive. Livni wants to be prime minister one day. For that to happen, Israel must survive until she wins an election. And Israel will not long survive if it surrenders its right to its capital. One might have thought that American Jews could be counted on to stand by Israel on this issue. But then, one would be wrong. FOR THE past six years, Republican Senator Sam Brownback has repeatedly submitted a bill to the US Senate that, if passed into law, would revoke the presidential waiver that has allowed successive presidents to refuse to implement the 1995 law requiring the State Department to move the US Embassy toJerusalem . This year Brownback co-sponsored his bill with Independent Senator Joseph Lieberman. As luck would have it, the Brownback-Lieberman bill was submitted two weeks before Obama launched his latest campaign against Jewish building inJerusalem. According to Sen. Brownback’s office, the paper never had any criticism of the same bill when he submitted it during president George W. Bush’s tenure in office. But now, as Israel’sgovernment and opposition stand shoulder to shoulder protecting Israeli control over Jerusalem from assaults by Obama, Kansas City’s Jewish newspaper’s editorial board willingly bucked what it acknowledged are the wishes of “Jews and Christian Zionists,” in order to stand by their man in the Oval Office. Some of Israel’s most high-profile supporters in the US are conservative talk radio and television hosts like Rush Limbaugh, Mark Levin, Sean Hannity and Glenn Beck. But rather than thank them for their support, the Anti-Defamation League, which is supposed to be dedicated first and foremost to defending Jews from anti-Semitism, published a special report this week where it insinuated that they cultivate a climate of hatred and paranoia which could endanger Jews among others. The ADL report, “Rage Grows in America: Anti-Government Conspiracies,” dubbed Beck the “fearmonger-in-chief,” for his opposition to Obama’s domestic and foreign policies. It similarly castigated the so-called “tea party” movement which has attracted millions of Americans opposed to high taxes, and the townhall meetings this past summer where millions of Americans peacefully argued against Obama’s healthcare policies. The ADL’s decision to issue a special report attacking Obama’s political opponents and insinuating that Americans who oppose him cultivate an environment in which paranoid and dangerous fringe groups feel comfortable operating is strange given that the ADL never put out a similar report against parallel anti-Bush movements. As Commentary’s Jonathan Tobin noted this week, the ADL was more likely to see overt and vicious anti-Semitic statements and placards being waved around at anti-Iraq war rallies than at anti-Obama healthcare and tax policy demonstrations. Ironically, the ADL has a specific institutional interest in combating leftist paranoia. A recent movie attacking the ADL called Defamation, by leftist, anti-Israel Israeli filmmaker Yoav Shamir, is currently hitting the film festival circuit in the US and Europe. A major hit among anti-Israel activists and regular anti-Semites on the Left and Right, Defamation accuses the ADL of exaggerating the Holocaust and anti-Semitism to justify what Shamir views as its nefarious aims. Apparently, tribal loyalty to the Left trumps the institutional interests of the ADL. It certainly trumps the interests of New York University’s Hillel director Rabbi Yehuda Sarna. As James Taranto reported on Wednesday in The Wall Street Journal, this week Sarna called for NYU’s Jewish community to join NYU Muslims at a rally that both commemorated the massacre at Ft. Hood and denounced NYU professor Tunku Varadarajan for writing a column in Forbes magazine. In his article, Varadarajan committed the crime of stating the obvious fact that Ft. Hood terrorist Maj. Nidal Malik Hasan was motivated by his Islamic beliefs when he shouted Allahu Akbar and shot some 40 people, killing 13. Given that people and groups like al-Qaida and Hamas that share Hasan’s views assert that all Jews should be killed, it would seem that the good rabbi would not feel the need to attack professors who point out that Hasan’s views are dangerous. But then, it is no longer strange to see Hillels on American university campuses behaving in a manner that is not in line with what might be considered the interests of either the American Jewish community or the Jewish people as a whole. Beyond its derogatory treatment of Jewish and Israeli holidays, Berkeley’s Hillel has allowed an extremist group called Students for Justice for Palestine to participate in its organizational meetings. No doubt owing in part to Berkeley Hillel’s decision to permit SJP members to spread their propaganda at its organizational meetings, Hillel’s student leaders and members participated in SJP’s Israel Apartheid Week this past March. The poster was issued to publicize a conference in Haifa called “My Land, Space, Body and Sexuality: Palestinians in the Shadow of the Wall,” whose purpose was to demonize Israel using post-modern jargon. Unlike Hillel, NIF is widely recognized as a far-left fringe group. But as Arab Israeli NGOs use the dollars of American Jewish NIF donors to advance their “civil society” programs aimed at delegitimizing Israel’s right to exist, the Reform Movement – which is not a fringe group – decided unanimously two weeks ago to criticize and pressure Israel for what its leadership views as Israel’s unfair treatment of its Arab citizens. As this column goes to press, if its board members don’t cancel their meeting, the San Francisco Jewish Federation will be grudgingly voting on a resolution that would prohibit it from sponsoring events that denigrate or demonize Israel or supporting organizations that partner with organizations that call for divestment, sanctions or boycotts against Israel. The resolution follows the Jewish Federation of San Francisco’s decision to co-sponsor the San Francisco Jewish Film Festival last summer. That festival featured Shamir’s Defamation, and the egregiously anti-Israel film Rachel, about the late pro-terror activist Rachel Corrie. The film festival was also sponsored by the anti-Zionist Jewish Voices for Peace group, the American Friends Service Committee, which hosted a dinner for Iranian President Mahmoud Ahmadinejad in New York last year, the Rachel Corrie Foundation and other radical anti-Israel groups. If the vote takes place, it will be a great victory for a small group of local Jewish activists. These individual Jews have banded together because they are deeply disturbed by the federation’s willingness to use community funds to advance events whose basic message is that Israel should be destroyed. KADIMA’S INTERESTS as a political party place it at loggerheads with the government on almost every issue. But its leaders this week were rational enough to recognize that they must support Israel’s sovereign rights in Jerusalem despite the fact that doing so placed it on the government’s side. Their display of sanity is a clear indication that Israeli society today is healthy and capable of meeting the challenges it faces. It is clear that most American Jews believe that it is in their interests to support the Democratic Party and the Left. But like the anti-establishment Jewish activists in San Francisco, American Jews ought to realize that on issues like Israel’s survival and their own survival as Jews they ought to stand by their interests even when they seem to clash with their leftist and Democratic loyalties. And they ought to stand by their friends on these issues, even when their friends are conservative Republicans. It can only be hoped that the San Francisco pro-Israel upstarts’ campaign against the federation was successful yesterday. Then, too, if the American Jewish community is to long survive, these San Francisco Jewish activists’ demand that their community support Israel’s right to exist must be joined by their fellow American Jews throughout the country. Caroline Glick is deputy managing editor for the Jerusalem Post. She writes two weekly columns. She is also the senior fellow for Middle Eastern Affairs at the Center for Security Policy in Washington, DC and travels several times a year to Washington where sheroutinely brief senior administration officials and members of Congress on issues of joint Israeli-American concern. In 2008, her book, Shackled Warrior: Israel and the Global Jihad was published by Gefen Publishers. She can be reached at caroline (at) carolineglick (dot) com. The first time Christopher Campbell converted to Judaism, he changed his name to Yisrael and got circumcised. He became a Reform Jew. The second time he converted to Judaism, he became a Conservative Jew. He got circumcised again. The next and final time he converted to Judaism, he became an Orthodox Jew. And yes, he got circumcised again. And that is the story at the heart of “Circumcise Me,” a new autobiographical off-Broadway show about the question of who defines identity: you, your community or a tradition existing since the first circumcision of record, that of Avraham Avinu, the Patriarch Abraham, the father of all converts. “Circumcize Me” debuts Sunday, November 1st at Manhattan’s Bleecker Street Theatre at 45 Bleecker Street through January 3rd. The show is an outgrowth of Yisrael’s stand-up comedy performance and DVD of the same name. In his days as Christopher, he trained as an actor at Circle in the Square. His new show is both a return to the stage and an integration of his ever-evolving identity. Read more about Yisrael and other one-person shows in today’s issue of Backstage. The Welcoming Synagogues List on the Jewish Multiracial Network offers a list of synagogues multiracial families and individual Jews of color have felt comfortable attending and are now recommending to others. The list does not yet include synagogues outside the United States and in Israel. The project is actively looking for suggestions in both categories, as well as in the United States. If you are not a Jew of color or part of a multiracial family but you know someone who might be interested in helping provide information for this list, please forward this post to them. Ideally, all synagogues will be welcoming to every Jew of every color! Hat tip to blogger La Jewminicana, aka Aliza Hausman, a Dominican-American Latina and Orthodox Jewish convert, for bringing this to our attention. During his trip, Zulu dancers invited Lior to play African music, also known as “Violina Violina.” The performance took place in Durban, South Africa. At this time of rejoicing in the holiday of Sukkot, Hoshana Raba, Shemini Atzeret and Simchat Torah (holidays you may have never heard of! ), here’s something easy on the ears: a sampling of Lior’s musical adventures. Chag sameach/happy holidays! Lior plays violin at the far left hand side of the screen! Watch Part II here or below. Lior Kaminetsky earned a Masters’ degree in Violin performance & Musicology from the Jerusalem Academy of Music and Dance and the Hebrew University. Currently lives in Los Angeles, pursing a D.M.A degree (Doctor of Musical Arts) at the Thornton School of Music at USC. He has won various awards from the Universite De Sorbon, Gratz Academy and the Schwerin Academy institutions, and from the Ella Fitzgerald Charitable, Nowakowsky and America-Israel Cultural Foundations. Kaminetsky serves as the west coast music critic for the Israeli newspaper Yedioth. He has performed widely abroad and has appeared on radio and TV as well as in the documentary film, “Dying to Live,” by Ben Mittleman. ¡Felíz Año Neuvo y Felíz Sukkot! A project of the American Jewish Committee, this event brings together Christian Latino leaders with rabbis sharing with them the beauty and meaning of Judaism, the importance of a secure Jewish homeland in Israel and the holiday of Sukkot, which begins tonight, October 2, 2009. Learn more about the AJC’s Third Annual Essence of Judaism Sukkot Celebration, slated for October 8, 2009, at Sinai Temple in Los Angeles at www.ajclosangeles.org. Or contact Randy Brown at (310) 282-8080 or brownr (at) ajc (dot) org.